Matthew Weaver is hard at work in the kitchen of his new Route 137 store, Weaver's Roadside Variety. 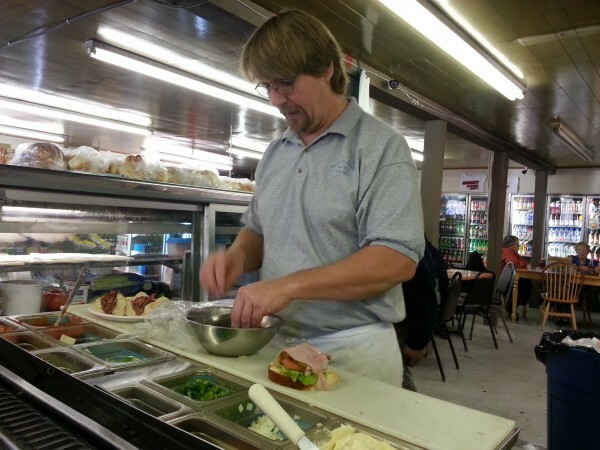 There, he's making bread, rolls, pastries and more for customers who come from around Waldo County. WALDO, Maine — Most mornings for the last two decades, Matthew Weaver has risen before dawn in order to make the doughnuts — as well as the bread, rolls, whoopie pies and other treats for sale at his family’s bakery in downtown Belfast. Since the beginning of November, Weaver has taken his recipes and his sure hand with dough to start his day at a new location: Weaver’s Roadside Variety on Route 137 in Waldo. He purchased the convenience store and did some remodeling to allow more space for diners and more room for him to bake and to fill the counters with bags of plump knot rolls, loaves of bread, giant whoopie pies, containers of baked beans and much more. In addition to the baked goods, Weaver also is offering a full-service deli, homemade pizza, sandwiches and an expanded line of beers for sale in the coolers as well as groceries and gasoline. He said that while he had not intended to open his own business, a change at Weaver’s Bakery meant that he could pursue a new endeavor. In recent months, the downtown Belfast business, which opened in 1954, has changed its focus. While still baking, current management there specializes in cupcakes and pre-ordered pies. Three women eating sandwiches said that they are happy that the variety store is offering some old favorites. Barbara Pearson of Searsport said that her husband, Pete, who died several months ago, had been a stalwart customer of Weaver’s Bakery. He was one of many area men who met there for early morning coffee and conversation, famously solving world problems as they chewed the fat, and the doughnuts. Her daughter, Debbie Bryant of Belfast, said that they had gone to Weaver’s Variety to have lunch there in her father’s honor. Matthew Weaver said he’s happy with how his first month has gone. Already, customers are waiting for him to open the doors at 5 a.m. in order to grab a quick bite before work. This winter, he hopes that the store’s location on a major snowmobile trail will provide him with a new clientele. “We’re just trying to get rolling, that’s all,” Weaver said.